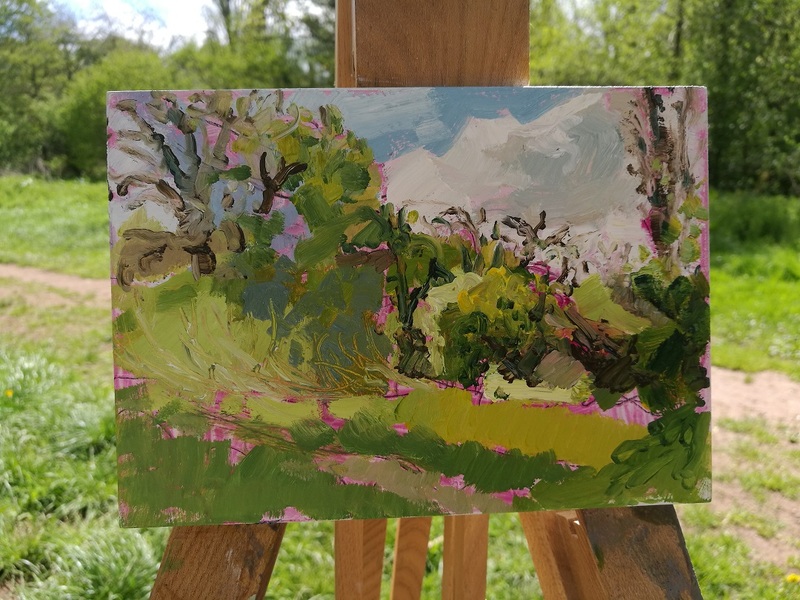 This journal is a collection of thoughts and lessons learned when I gave painting en plein air a go. My painting session was just 1-2 hours long. 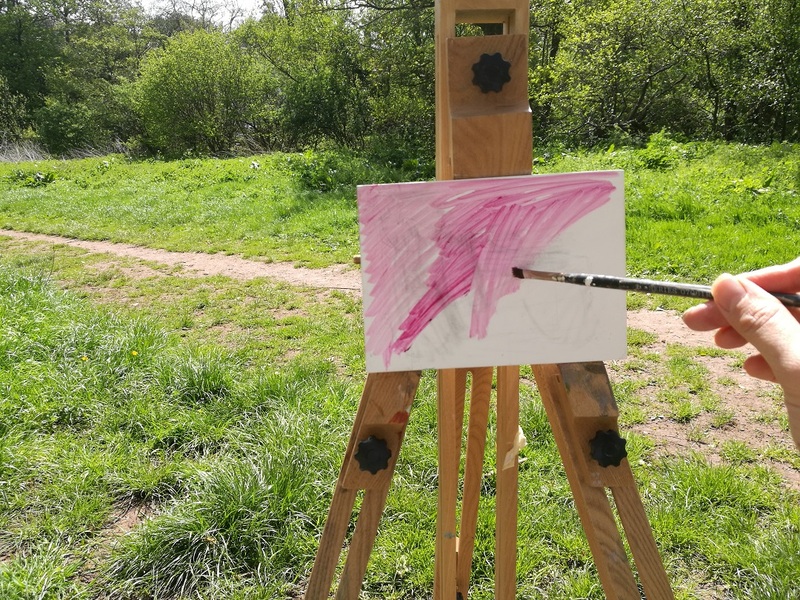 Outdoor painting is a concept I often feel a little intimidated by. 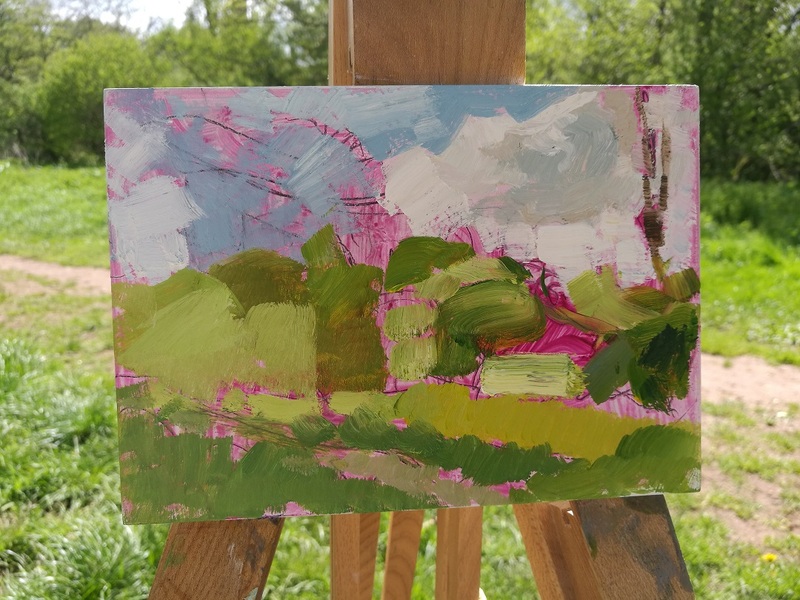 I tend to only paint en plein air on holiday. However I have found that working small and keeping things practical and comfortable the experience can be extremely rewarding. 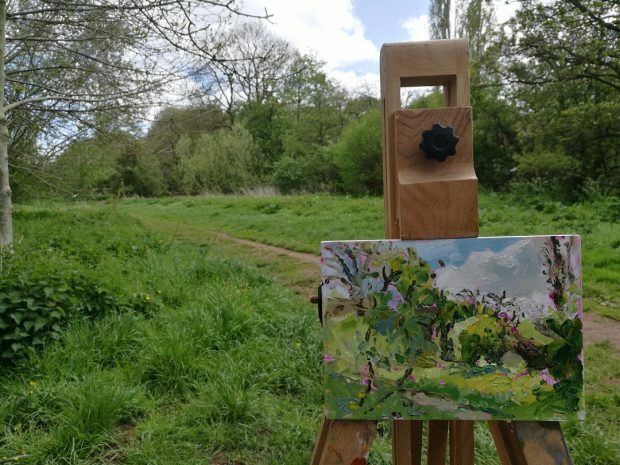 The venue of my Plein Air Painting session was some land by the River Tone, one field away from where I live. 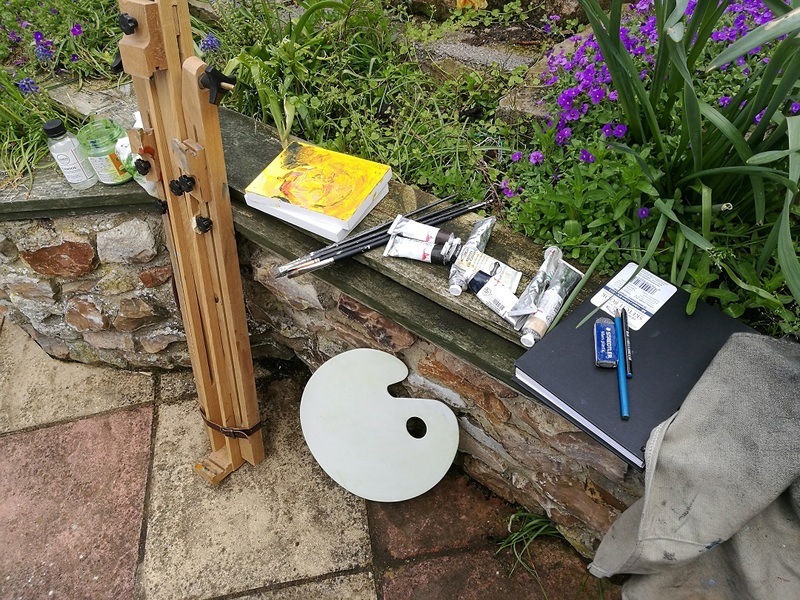 Everything I took on my Plein Air Painting session. Packing your bag – Travel light! 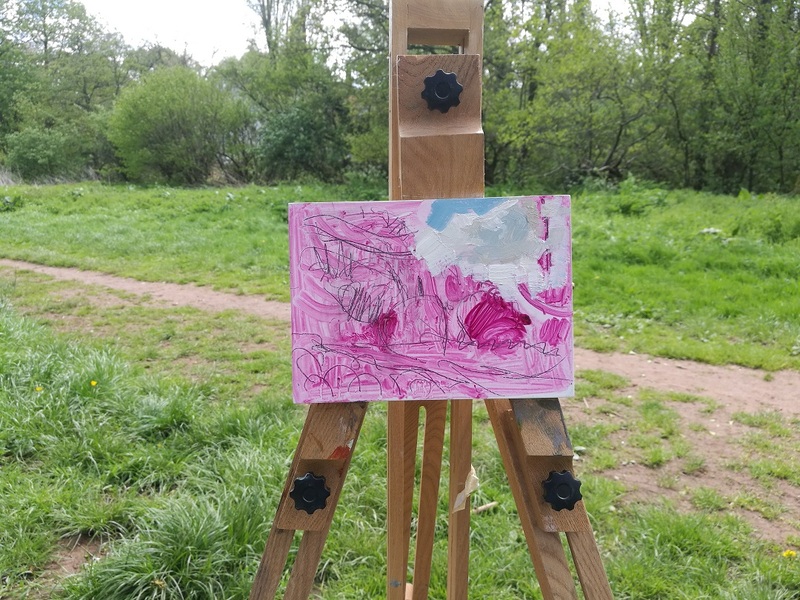 My firm belief is that practicality and comfort are at the forefront of a successful plein air session. It doesn’t sound particularly romantic I know. Put it this way – I find painting indoors hard enough. If you combine the anxiety that lays between a loaded brush and a blank canvas with feeling cold, an easel that blows over every 5 minutes, and people glancing over and making comments at your work in progress… it quickly feels like an impossible task. Make it as easy for yourself as you can. One’s enjoyment of a painting experience can be seen in the work itself. 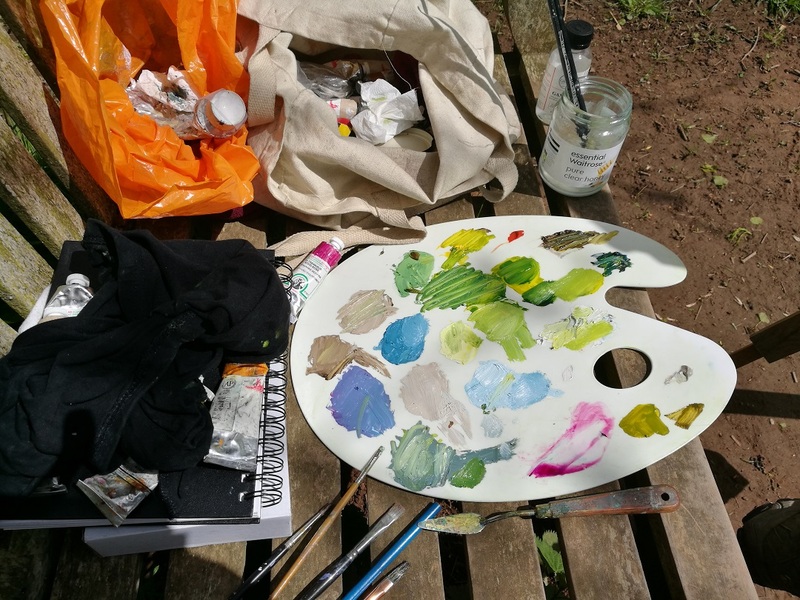 The whole process of making your plein air session easy starts with how you pack your bag before setting off. TRAVEL LIGHT. I’ll list the things I took and my thoughts behind them. 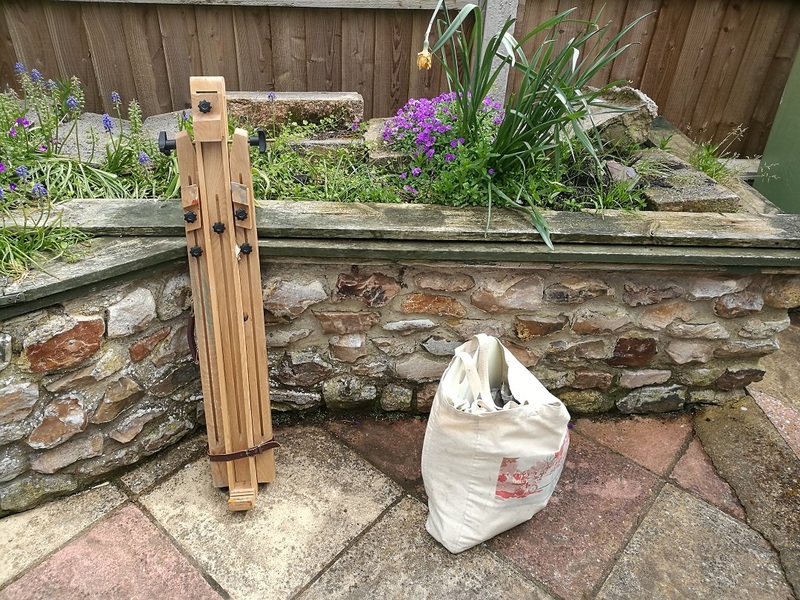 Field easel – my field easel is wooden, and sturdy, and I’ve had it for years. It’s similar to a Dart by Winsor and Newton. 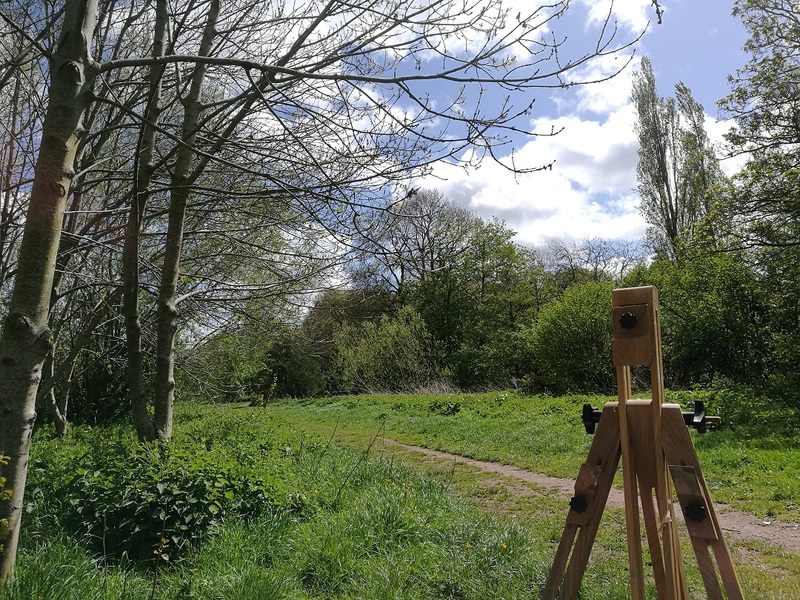 You want to take a field easel that you can carry for the distance you’ll need to carry it for, and something that isn’t going to blow over too easily. I saw recently on Landscape Painter of The Year an artist that anchored his easel into the ground with tent pegs – I’m definitely going to give that a go in future! A jar of solvent – I like to use Gamsol. It has no odour even though it is an artist’s white spirit. I took a little 60ml bottle (no weight) and an empty jar with its lid, so you can bring dirty solvent home with you to dispose of properly. 2 x Jackson’s gesso panels. They were both 7″ x 5″, so pretty small. It’s a windy day so I didn’t want to paint too large – canvases can act like sails and blow all over the place. Plus because I’m not very experienced at this, I wanted to work at a scale that felt manageable. I also brought the cardboard box they came in, because I figured if I painted on them both I could stack them on top of one other and put them back in the box to carry them home – the wet paint would suffer a lot less than if I carried them with my hands. I love these panels, they are very smooth, lightweight and a real pleasure to work on with both thick and thin oil paint. Brushes – 7 in total, in a range of shapes and sizes. Strike the balance between what you like painting with the most, and variety. Until you know your subject you don’t know how you might like to tackle it. I ended up only using 3 of the 7 brushes for my painting, but I was glad to have the choice with me. (I took: Shinku Synthetic Flat size 4, Black Hog filbert size 3, Black Hog Round size 2, Black Hog filbert size 4, Procryl Flat size 6, Isabey Isacryl flat size 0 and Procryl flat size 2). Paints – paints are the one thing I don’t hold back too much on, because I hate that feeling of being without the one colour you need. Although I always use a fairly limited palette, I took at least 20 tubes of paint. My favourites are Old Holland and Michael Harding. Apron – because I don’t travel far without it!! Plastic palette – I don’t get on with tear off palettes as they fly all over the place. This kidney plastic palette is just right for me. Rags and kitchen roll – so vital for blotting brushes, lifting colour from the canvas and wiping your hands with. Don’t forget rags!! All this equipment (minus the easel) fit into my canvas bag. A rucksack would have been better, but the load was manageable. Everything packed away, ready to go! What to Wear – Be Practical! Although today is 12 degrees, it is very windy, and I find it difficult to paint when I am cold or wet! So it’s important to wear sensible clothes. Always wear stuff you don’t mind getting paint on. I wore several layers, a waterproof jacket, walking boots with waterproof socks (they keep my feet toasty!) and took a fleecy hat. I know that even on a sunny day it can get very cold when you are standing still for a long period of time. However, I ended up painting somewhere well sheltered, and ended up taking the jacket and hat off, as well as my jumper! I then set off to the river. Here’s where I parked my easel. This is always a challenging aspect of painting out of doors for me. I knew I wanted to be in the fields by the river because it’s secluded, away from cars, with few people. 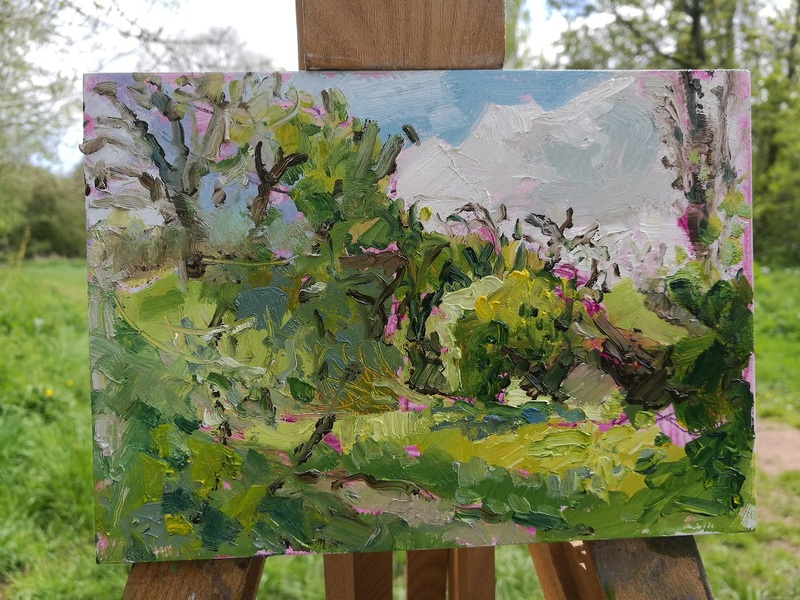 I am often drawn to very small subjects – a few leaves, for example, but for this exercise I wanted to paint a bigger view. As it is spring there is a lot of green around! This can be difficult to translate into a satisfying composition. I identified a potential subject – a view of the bridge over the Tone, but I finally decided to choose comfort over what looked the most interesting subject; I parked myself on the first bench I could see – I’m not too ashamed to admit it! The better view was probably in the shade, in the mud, in a very cold spot. But the warmth of the sun on the convenient bench would help me stay in one place for longer, and in the end I’m glad I painted where I did. All that matters is that you feel you can make something interesting with what you can see. A good view has definite shapes to it, a range of tones and a sense of rhythm. But only you can decide whether you are inspired by what is in front of you. And sometimes you don’t know until you start to paint. 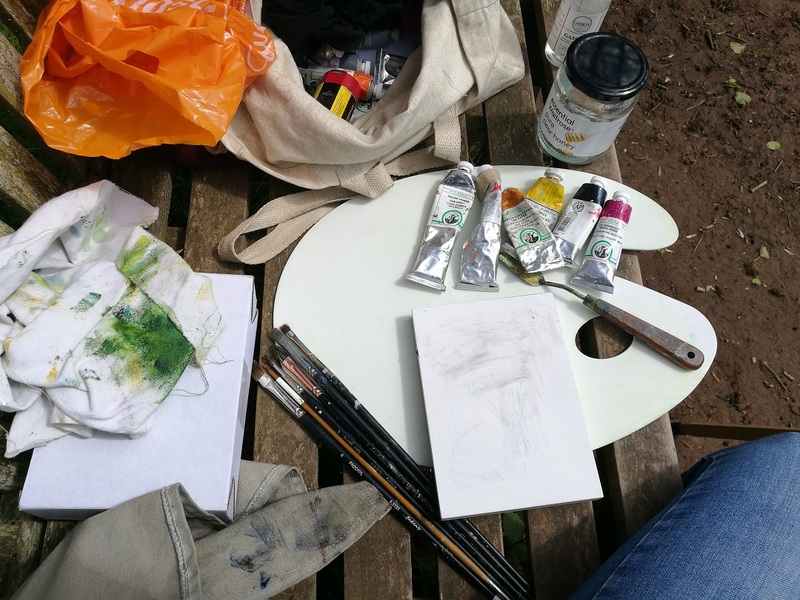 I ended up only painting one of my panels, and my thinking was that by painting sat on the bench in the sun I could ‘warm up’ – get a feel for the sensation of painting out of doors. But in the end I was happy with my first attempt. A really useful thing to remember is that you mustn’t feel you have to ‘get everything in’. An artist is an interpreter of a scene and your role is to tell the story you want to tell. Edit out anything that is not part of your individual story. It’s vital that you identify what you want to say as it will help you work out what components of the view are part of the story, and what parts are superfluous. I then needed to get myself organised. It’s vital to have everything you need within reach. The light is always changing and it can be very frustrating if you can’t find the one paint you’re looking for. I bring out the 6 tubes of colour I think I’ll need for the subject I have chosen. Initially I thought I was going to draw the composition straight on to the panel, but then I decided instead to do a lay-in with ultramarine pink. This involved diluting the oil heavily with Gamsol and using a brush to cover the panel, and then use a rag to establish areas of light tone. I then added some slightly thicker pink paint in the darker areas, and used my graphite pencil to draw in some details. 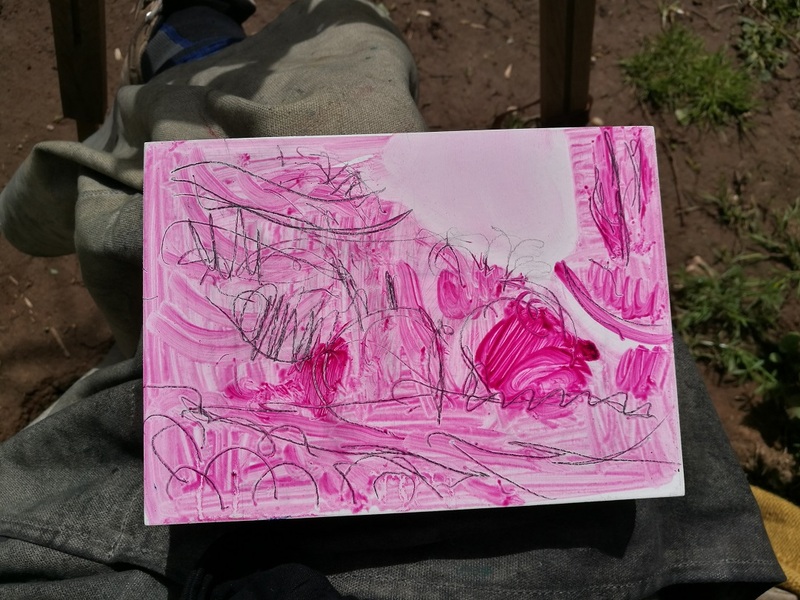 I then put my panel on the ground in the sun as I wanted the pink to dry as much as possible while I had a look at the colours I intended to use next. I squeezed out a bit of Michael Harding Yellow Lake, Old Holland Red Gold Lake, Old Holland Raw Umber, Old Holland Indigo, Titanium White and Old Holland Warm Grey Light. Note no greens! I prefer to mix my own. My next move is to mix combinations of these on to my palette, in a slightly random fashion. I’ve got in the habit of doing this recently as it helps me see the potential of my limited palette of colours. I don’t always know what colour mixes can be achieved with the paints I have squeezed out so it’s good to see some of the options! By the time I have done this my underpainting is almost completely dry, and I start laying the sky on. I’ve decided to use the paint neat and it goes on the panel thickly with the brush marks showing. A tip I have picked up is to work on the elements furthest away and move gradually closer. So I start with the sky and then decide to place the main areas of colour over the whole panel. I leave little patches of the pink to come through. It keeps a freshness to the work. Here’s my painting after I established the main shapes in the colours I was using. I then work into the painting by adding the tree trunks and main branches using raw umber and indigo. I gradually break up the shapes with subtle shadows and highlights. It is really important to stay disciplined – keep the colours clean. This can be tricky when working with thick paint. I blot my brushes on my rag after every brush mark I make for this reason. I think it’s important to see the big shapes of a composition and use big brushes, and then go smaller as you go on. That way you don’t lose the overall design and you maintain a clearer sense of light and shade. At the very end I added a tree in the very near foreground but then instantly regretted it, so I painted it out again! It’s possible that the left hand side of the painting got a bit muddy as a result. However I wanted to just stop, rather than try and fix the issue. Looking at the painting now I like the slightly degraded colour mixes. They contrast nicely with the purer colours towards the middle of the painting. 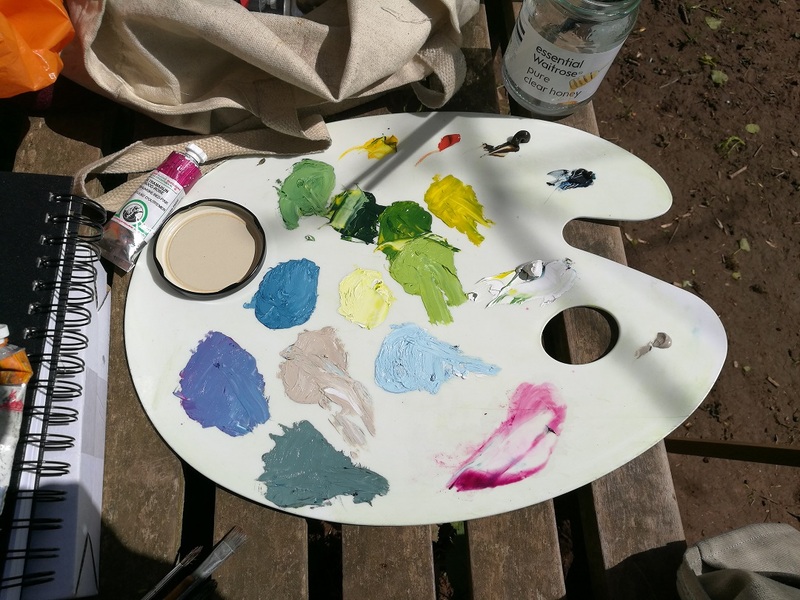 My palette at the end of the painting session. I managed to keep the pools of colour fairly clean! Result! Changing light conditions is an outdoor painter’s biggest challenge. I minimised the challenge by working small. Occasionally the sun went behind a cloud and everything changed, but it was never for long. So I just waited and carried on painting when the sun came out again. Once I finished the work I packed away, taking everything with me. Now I have the joy of cleaning my palette and brushes to look forward to! My advice to anyone thinking about painting out of doors for the first time is to keep things simple. That way you have room to enjoy the experience. I have definitely returned wanting to do more outdoor painting, possibly on a more ambitious scale next time! try ultramarine pink next time. Love the end result! Well done. Thank you, I hope you have had opportunity to get outside and paint!